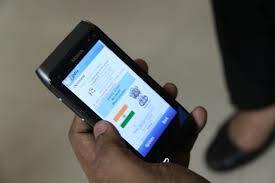 •	India has the cheapest mobile data in the world as per the research by price comparison site cable.co.uk. The global average was USD 8.53 for 1GB. •	Compared to global average of about Rs. 600, 1GB is costing just Rs. 18.5(USD 0.26) in India. In the same case countries like UK has USD 12.37 for the same amount of data. •	India is the second largest smartphone market in the world after China with over 4.30 million smartphone users. The study was based on 6313 mobile data plans in 230 countries. •	India is followed by Kyrgyzstan with $0.27, Kazakhstan with $0.49, Ukraine with $0.51 and Rwanda with $0.56. For Indian market, researchers studied 57 plans which are available in the country from as low as Rs.1.41 to a maximum of Rs.98.83. •	World Bank to provide $250 Million dollar for the National Rural Economic Transformation Project (NRETP) to boost Rural Incomes across 13 States in India. •	The Agreement was signed by Mr. Sameer Kumar Khare, Additional Secretary, Department of Economic Affairs on behalf of the Government of India and Mr. Hisham Abdo, Acting Country Director, World Bank India, in New Delhi. •	The loan will help women in rural households develop viable enterprises for farm and non-farm products. •	The $250 million loan has a 5-year grace period, and a final maturity of 20 years. •	India signed a loan agreement with the World Bank for 96 Million US dollars for additional financing of Uttarakhand Disaster Recovery Project. •	World Bank has been supporting the State Government since 2014 to restore housing and rural connectivity. •	The Project has completed more than two thousand permanent houses and 23 public buildings and restored over one thousand 300 kilometers of roads and 16 bridges so far. •	The additional financing of 96 million US dollars will further help in the reconstruction of bridges, road and river bank protection works in the state. •	According to the latest report by the World Gold Council (WGC), India, the world’s largest consumer of gold, has the 11th largest gold reserve, with the current holding secured at 607 tonnes. •	The number one slot is occupied by the U.S., which has gold reserves of 8,133.5 tonnes, followed by Germany with 3,369.7 tonnes. 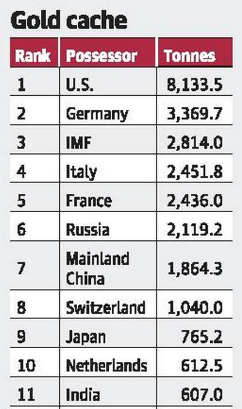 •	International Monetary Fund (IMF) is positioned at third rank on the list with total gold reserves of 2,814 tonnes followed by Italy and France with reserves of 2,451 tonnes and 2,436 tonnes respectively. •	Among Asian countries, China (1,864.3 tonnes) and Japan (765.2 tonnes) have more gold reserves as compared to India. •	The Reserve Bank of India (RBI), which added 6.5 tonnes of gold to its reserves in January 2019, taking its total holding forming part of its foreign exchange reserves to 607 tonnes, is set to become the 10th largest holder of gold worldwide, displacing the Netherlands.